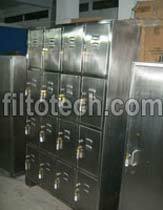 Our expertise lies in making available an expansive range of Cleanroom Equipments. Made using 304 or 316 grade stainless steel, our Cleanroom Equipments ease the task of wash-down & cleaning. We have designed Cleanroom Equipments for customers with ultra hygienic standard. We are a credible Manufacturer & Supplier of Cleanroom Equipments.